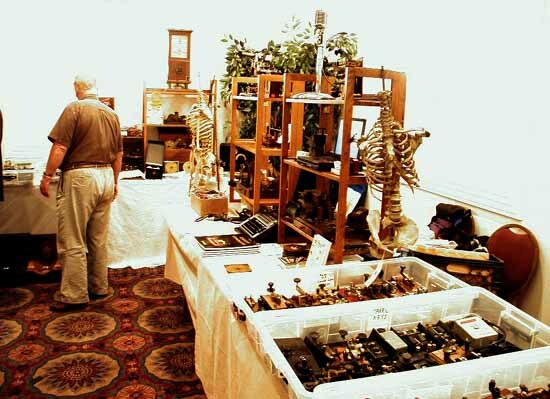 Prof. Tom Perera - W 1 T P - Historian and Collector. This museum contains a number of interesting scientific instruments which I have acquired while searching for telegraph instruments. 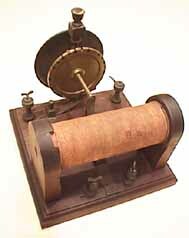 I am always interested in trading scientific instruments for early and interesting telegraph instruments. The items in this museum which are still in my possession are available for such trades. Items which have been traded are also included in the museum for reference purposes. 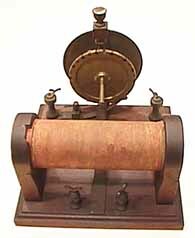 FARADAY PHILOSOPHICAL MOTOR (Now in the John Williams Collection):(32KB) This early motor was used to demonstrate the turning force of an electric current passing through a wire It consists of two circular pools which are to be filled with mercury. Into these pools dip contacts at each end of a vertically mounted iron bar that is suspended by two pivot points at top and bottom. 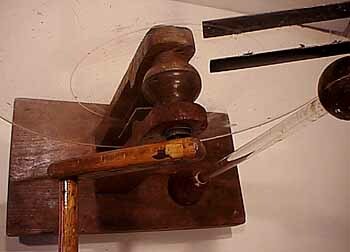 When electricity is applied by way of the mercury pools, the bar rotates in a horizontal plane. One of these units is on permanent exhibit at the Smithsonian Institution. Circa 1830s. (Traded to John Williams). 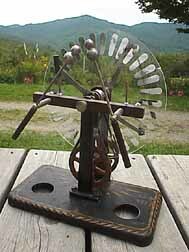 KING MENDHAM PHILOSOPHICAL MOTOR:(37KB) This copper wheel spins in a pool of mercury when a voltage is passed through it. The label reads: KING, MENDHAM & Co. Electrical Engineers & Contractors. Bristol. 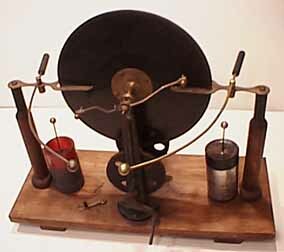 BARLOW'S WHEEL MOTOR & FARADAY DISK DYNAMO:(21KB) Demonstration apparatus manufactured by CENCO to show principles of Barlow's Wheel, the Faraday Disk, Magnetic Braking, and Lenz's Law. -traded. 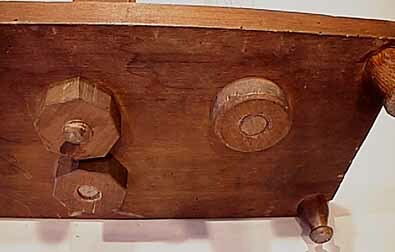 PHILOSOPHICAL MAGNETIC FORCE DEMONSTRATION APPARATUS:(16KB) This extremely early coil was used to study and demonstrate the principles of magnetic force.-traded. 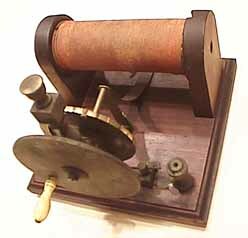 EXTREMELY EARLY INDUCTION COIL WITH MANUAL INTERRUPTOR:(13KB) This is an extremely early example of an induction coil. Turning the knob interrupts the DC going to the coil allowing it to step up the voltage. 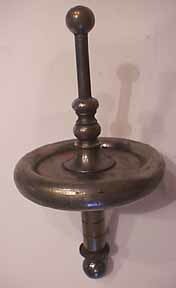 It may have been used fo  r philosophical demonstrations or for medical "treatments" but since it is not labeled, it's use is unclear. It is owned by collector Peter Malvasi - W2PM. 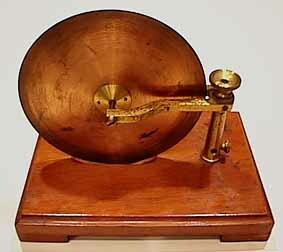 19th CENTURY GYROSCOPE:(6KB) This is a very lovely and early gyroscope. 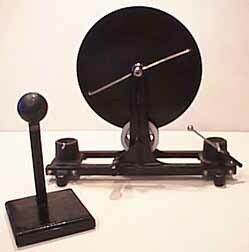 It was used for demonstrations of gyroscopic principles in an early University. It is put into operation by winding a string around the lower section and pulling it while keeping your finger on the cupped surface on top of the shaft. It is nicely machined. 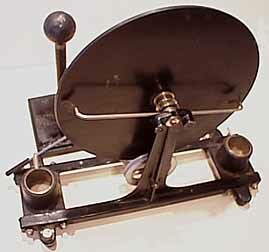 ANOTHER 19th CENTURY GYROSCOPE:(6KB)Very similar to the one shown above without the finger cup on the top. 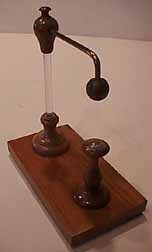 PYE COULOMB BALANCE:(48KB) This unusual device balances out the attraction between the two balls and a magnetic field created by the horizontally mounted coil of wire. It is capable of measuring very small amounts of current. 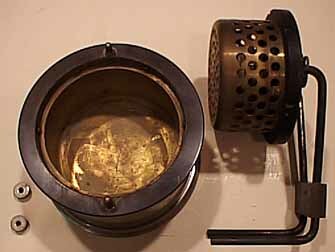 EARLY THOMPSON MIRROR GALVANOMETER:(18KB) Manufactured by ELLIOTT BROS. - LONDON: This tripod-based all brass Thompson mirror galvanometer number 502 has overhead compensating magnets extending up from the top. 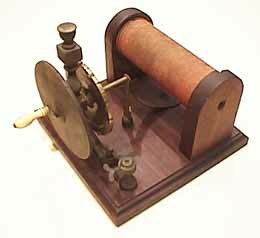 This unit is the same kind as the one on Thomas Edison's desk while he was experimentg with early telegraph systems. - TRADED. KNOTT APPARATUS COMPANY MIRROR GALVANOMETER: (12KB) The Ivory label reads: Designed for International Correspondence Schools, Scranton, PA. 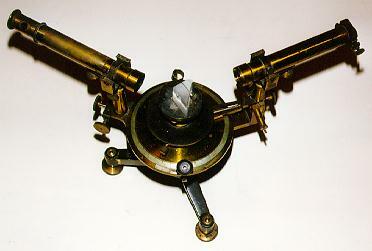 Manufactured by L. E. Knott Apparatus Company, Scientific Supplies, Boston, MASS. 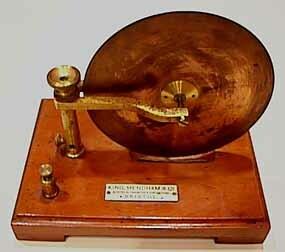 CAMBRIDGE INSTRUMENT CO. Ltd - ENGLAND: (94KB) A large beautiful complex brass galvanometer with hair thin meter needle, compensating magnet, and mechanism sticking up out of center of a large round brass base with leveling screws. Number C143520. - TRADED. 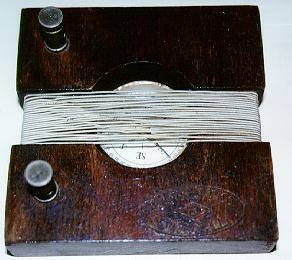 EARLY GRAMME RING HORIZONTAL COIL GALVANOMETER:(16KB) Very early and primitive horizontally mounted multi-tapped coil surrounding a horizontally oriented compass. CAMBRIDGE INSTRUMENT CO. LTD - ENGLAND Very very very tiny table top oil-filled mirror galvanometer with leveling screws.Number L-18096. -TRADED. 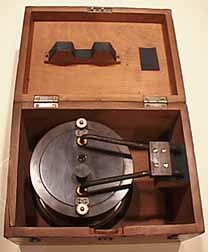 ABRAHAM RHEOGRAPH PRISM SYNCHROSCOPE: (32KB) This extremely rare prism synchroscope has an early synchronous-motor driven horizontally rotating triangular prism and mirror system that provides the time-base for the light beams from the two low-mass mirror galvanometers. This provides a dual-trace plus time-base display. Original finished wooden case. 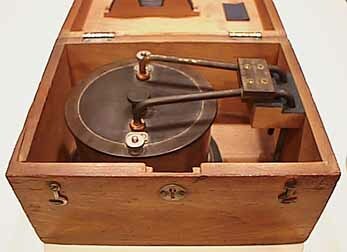 W. G. PYE & Co. - Cambridge England Small table-top mirror galvanometer with large magnet and 3 leveling screws- TRADED. LEEDS & NORTHRUP strange, very tall table-top mirror galvanometer with very large magnet and 3 leveling screws. Hard rubber panel -TRADED. 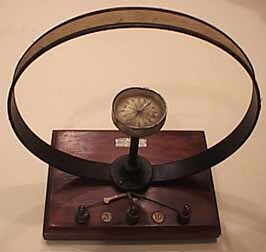 PHILIP HARRIS TANGENT GALVANOMETER:(25KB) A large 4" diameter horizontally oriented compass indicator is located in the center of a 7" vertically oriented coil of wire all mounted on a wooden stand with leveling screws. 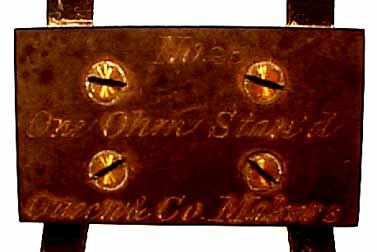 The coil taps are marked 2,50,& 500. Made by Philip Harris Ltd,Birmingham, England. 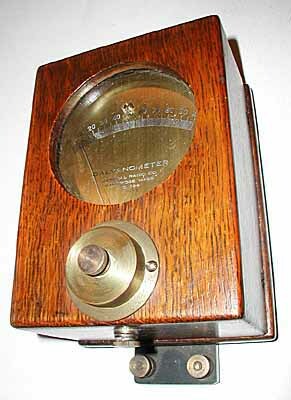 WELCH TANGENT GALVANOMETER:(14KB) Large diameter vertically mounted multi-tapped coil surrounding a horizontally mounted compass. 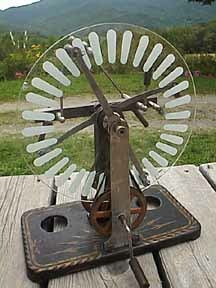 The amount of current in the coil is proportional to the tangent of the angle of deflection of the compass.-traded. 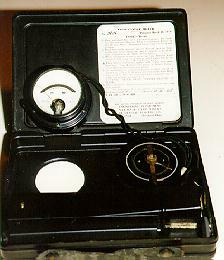 CENTRAL SCIENTIFIC TANGENT GALVANOMETER:(13KB) Similar to the Welch galvanometer described above.-traded. 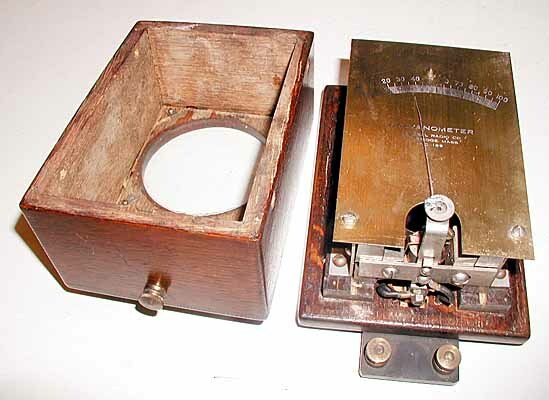 STOELTING TANGENT GALVANOMETER:(18KB) Very simple and primitive tangent galvanometer consisting of a compass mounted in a wooden block with a coil of wire wound around the block in a vertical plane. 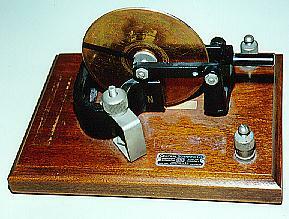 EARLY GENERAL RADIO MODEL 129 GALVANOMETER:(24KB) This is an early General Radio Galvanometer. It uses two internal horseshoe magnets and shows signs of having been partly manufactured by hand. 1 Hartmann & Braun huge decade box with elaborate brass contacts on very old hard rubber or ebonite panel mounted on a wooden base. Stamped: Made by Hartmann & Braun, Frankfurt A/M for Queen & Co. Philadelphia. Richtig Bei, 18, Grad Celsius. Extremely impressive with mounting hole in center for meter or additional decades. -TRADED. 2 ELLIOTT BROS - LONDON round brass decade boxes (galvanometer shunts) with very old hard rubber or ebonite top panels and contact blocks marked 1/9, 1/99/ 1/999. -TRADED. 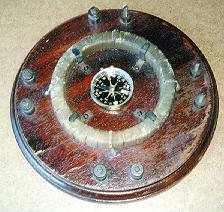 1 VERY EARLY ROUND BRASS DECADE BOX with old hard rubber panel marked G, R, +, 1, 10, 10 squared, 10 cubed, 10 to the 4th. Manufacturer's Logo only is capital "A" with "C" through it in the middle of a meter face symbol - TRADED. 1 LEEDS & NORTHRUP very early style resistance decade box. 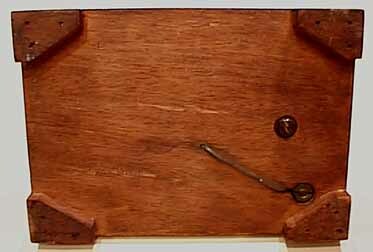 Hard rubber panel, brass contacts, rectangular wooden base- TRADED. 1 ELLIOTT BROS - LONDON very early # 623 decade box with Hard rubber panel, brass contacts, and rectangular wooden base - TRADED. 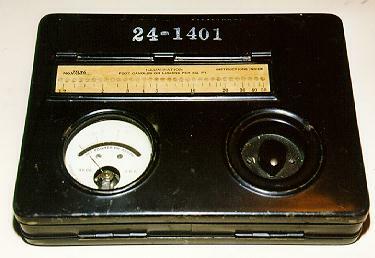 QUEEN & Co. Maker, number 25, 1-ohm standard:(14KB) Very early round brass base with hard rubber top panel and thick copper conductors all contained in fitted wooden carrying case. 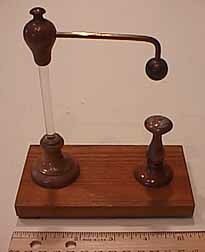 This was the standard used to define the first standard ohm.-traded. 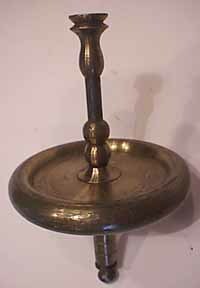 1 WESTON CLARKE STANDARD ELEMENT: A very old 5" high cylindrical metal base with rubber panel on top engraved Zn and Hc. 2 Brass terminals- TRADED. 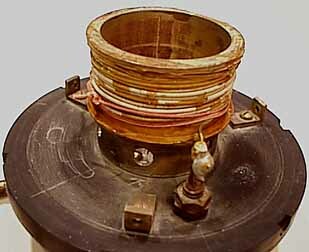 1 WESTON CLARKE STANDARD: A very old 1-1/2" cylindrical metal base with rubber panel on top & tapped coil of thick wire inside. Four Brass terminals are located on top - TRADED. 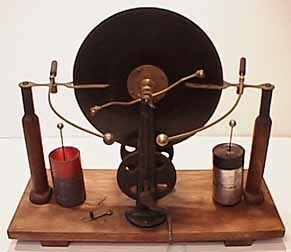 VERY EARLY GERMAN STATIC ELECTRIC GENERATOR:(9KB) This very early German machine was used to demonstrate the generation and characteristics of static electricity. The leather pads which brushed against the disk and the disk itself have been replaced with more recent parts. The lead foil which was glued to the upper part to conduct the electric voltage has mostly worn away but some of it is visible. The following pictures provide closer views of different parts of the instrument.-traded. 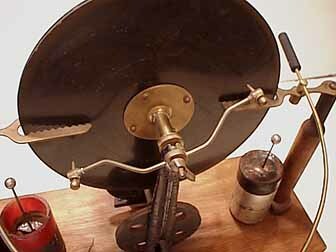 EARLY GERMAN STATIC ELECTRICITY SPARK GAP:(10KB) This small unit measures 5 inches wide. It provides a 1-1/2 inch spark gap for demonstrating the characteristics of electric sparks. The wooden lower post was covered with a thin layer of lead foil which conducted the voltage and which is mostly worn away.-traded. 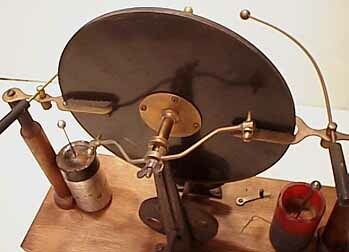 EARLY WIMSHURST STATIC ELECTRICITY GENERATOR:(15KB)This is an early example of a simple Wimshurst static electricity generator which was used in many universities to demonstrate the generation and characteristics of high voltages. 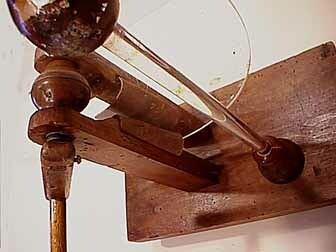 The two Leyden jars stored the generated voltages like modern-day condensers.-traded. 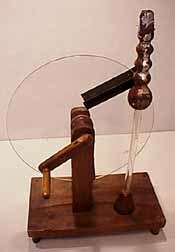 EARLY WIMSHURST STATIC ELECTRICITY GENERATOR:(19KB)This is a small Wimshurst static electricity generator which was used in Physics courses to demonstrate the generation and characteristics of high voltages. It is nicely decorated but it is missing the two Leyden jars.-traded. MORE RECENT WIMSHURST STATIC ELECTRICITY GENERATOR:(12KB)This machine was made by Central Scientific Corporation and is shown in their 1941 catalog. 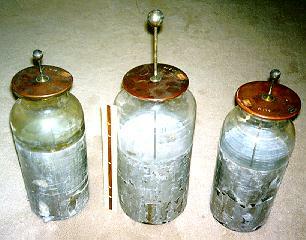 Several of the parts and both of the Leyden jars are missing but it is an example of the kind of devices which were used in schools and colleges to give demonstrations. It is shown next to a static ball which was also used in demonstrations: -traded. 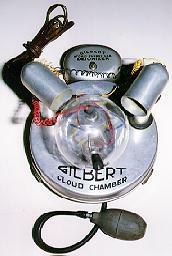 GILBERT CLOUD CHAMBER TOY:(13KB) The air pressure in the cloud chamber is increased by pumping the hand-pump to produce a "cloud" of water vopor. Then a high voltage is applied allowing the trails of the particles emitted by the source to become visible. 3 LARGE LEYDEN JARS:(20KB) From a very large Wimshurst machine. TRADED. 1 LEYDEN JAR: Very early and beautiful tapered glass Leyden Jar. -TRADED. 1 ELECTROSCOPE: Not exceptionally old but an interesting one.-TRADED. 5. METERS, TEST INSTRUMENTS, WAVEMETERS, ETC. 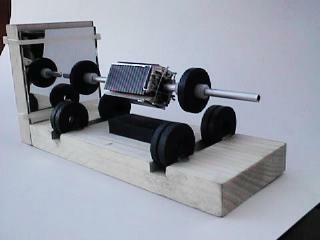 1 STOELTING wind-up metronome / mercury-dip variable repetition rate square wave pulse generator. 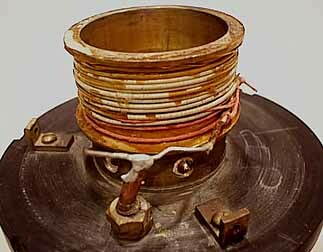 Consists of a typical spring wound metronome with separate mercury dip make and brake contacts that are activated every time the metronome ticks. 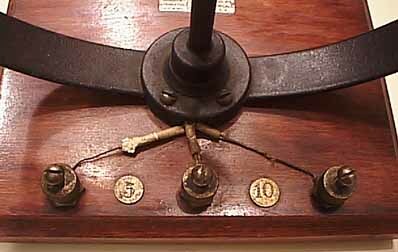 1 EARLY "FIRTH" Wavemeter. Old unit in lovely oak case. 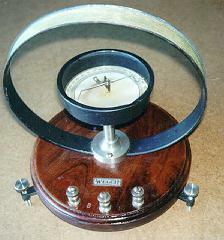 Label reads: WAVE METER, Bureau of Standards. Type L, Serial No. 38. Range 1500 - 20,000 Meters. Manufactured by John Firth, 81 New St. New York-TRADED. 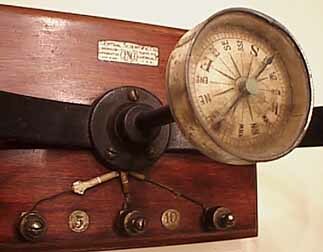 1 Very unusual HAND-MADE VOLTMETER with unusual tapered pole piece. 1 WESTON neck-worn model 280 multimeter for hands-off operation. 1 LEEDS & NORTHRUP 78770 Ultra high voltage double pole, double throw knife switch on very old hard rubber base.-TRADED. 1 LARGE VERY VERY EARLY X-RAY TUBE. - TRADED. MEDIUM SIZE VERY EARLY X-RAY TUBE. - TRADED. 1 CROOKES TUBE with horizontal rotating moving paddle whee.-TRADED. 1 MALTESE CROSS EARLY RAY TUBE. -TRADED. 1 ELECTRICAL TESTING LABS. 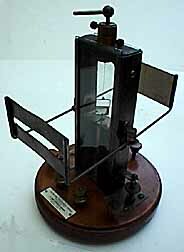 Photometric Standard Lamp # 9351. 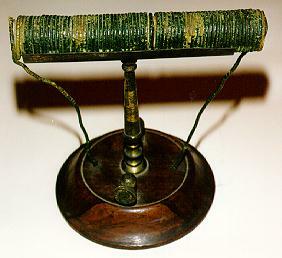 A calibrated and numbered lamp in a fitted wooden box. - TRADED. 1 CATHODE RAY TUBE GUN ASSEMBLY PROTOTYPE in glass tube neck with uncut connecting leads. - TRADED. 8. MISCELANEOUS AND ODDITIES, ETC. 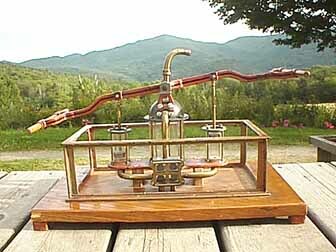 19th CENTURY SALESMAN'S SAMPLE TOWN FIRE PUMP:(23KB) This small working model of a 19th Century center-of-town-mounted Fire Pump was used to demonstrate how the pump works for prospective purchasers. The completed full size pump measures about 20 feet by 8 feet. 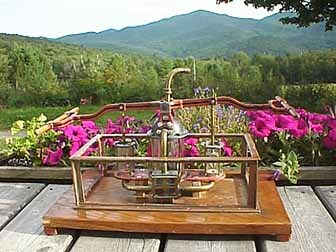 The glass trough is filled with water and at least two firemen pump the handles on each of the trough in an up-and-down motion to spray water on the fire.-traded. 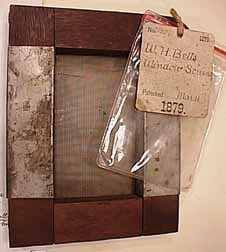 ORIGINAL PATENT MODEL OF EARLY WINDOW SCREEN:(14KB) This is an original model which was submitted in support of a patent number 213,091 which was granted on March 11, 1879. 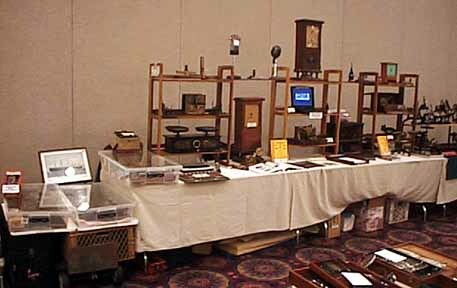 The patent model was stored in the US patent office until recently. 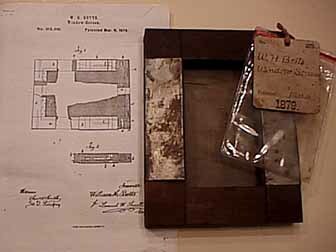 The patent covers an improvement to a window-mounted window screen which allowed the screen to be tightened through the use of a concealed roller.-traded. 1 CURTA MODEL 1 POCKET CALCULATOR:(29KB) This is a most complex mechanical pocket calculator with elaborate internal gear systems. Complete with original plastic carrying case and instruction manual. Traded 12-17-97. 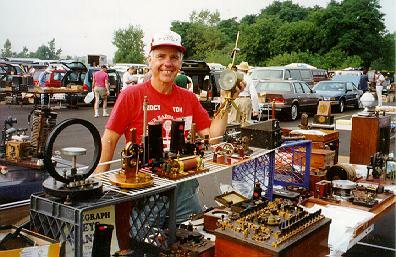 Tom Perera at the 1996 AWA show in Rochester, NY:(38KB) This photograph was taken by Austrian collector Dr. Franz Pichler. 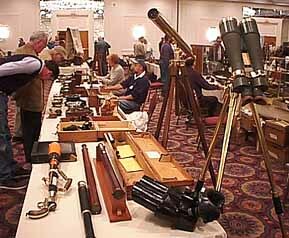 ANTIQUE SCIENTIFIC INSTRUMENT FAIR: This big show WAS held semi-annually in Central New Jersey and run by Marvin Hurvitz. It is no longer in operation. 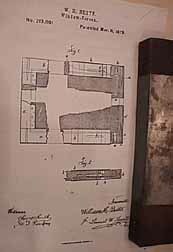 SCIENTIFIC, MEDICAL, AND MECHANICAL ANTIQUES - ISSN: 1080-2088: This publication contains interesting articles and advertisements and lists the important scientific instrument shows in the USA. Subscription is $ 24 per year. Greybird Publishing, PO. Box 412, Taneytown, MD. 21784.